There are few things I find more satisfying than a bowl of soup! In the same vein, there are few things I find more dissatisfying than coming home to a sad, random, slightly bare and slightly rotten fridge. You know the kind. Maybe you go away for a weekend, and then Monday evening rolls around. You open up your fridge to discover a couple of carrots, an egg carton with one whole egg and six egg shells (whoops), half a cabbage, and a Tupperware full of already-dressed, already-soggy salad. This feels bad. This feels confrontational. Your fridge doesn’t seem to get that you are hungry and you need it to go to the store for you. You’re tired. You’re hungry. You’re in no mood for grocery shopping. You protest by eating half a jar of pickles. This recipe was born out of one of those desperate pickle-eating situations after a weekend away. Lucky for you, I also had some carrots, celery and a couple of on the fence potatoes lurking around. 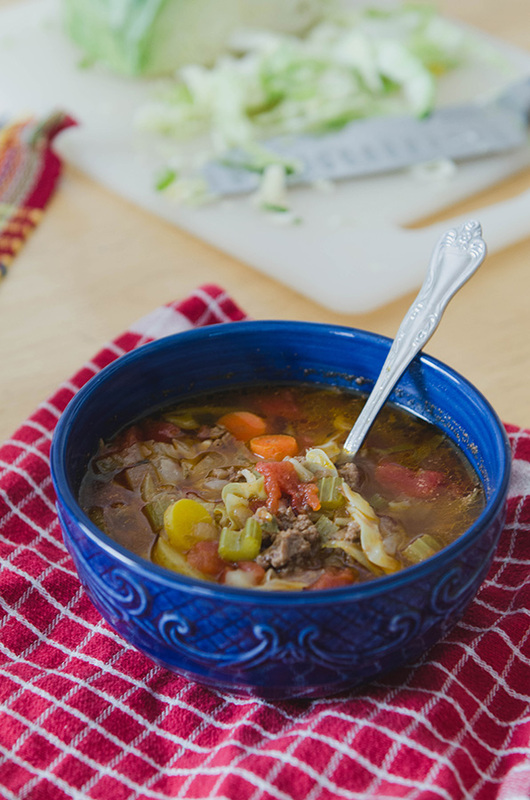 If not, you might be reading the recipe for Rustic Beef, Mustard & Re-Purposed Soggy Salad Soup. I feel like the number of Google searches for something like that is close to zero. But, whatever. The art of fridge-scrounging can’t be contained to the societal norms of non-mustard based soups. Also, lucky for you, I happened to have frozen beef broth and a can of tomatoes. Yeah… I backed away from the mustard. Even though it was dijon, and by all accounts fancy. I like to try and make recipes that don’t taste suspiciously like garbage. Life rule. This soup came together better than I could have hoped. You can best believe that when I started rummaging through my sad-looking fridge, I wasn’t like “OH YEAH, I’M GONNA BLOG THIS RECIPE SO HARD”. No. If anything I was just praying it would be edible. That’s real talk, my friends. But things worked out in a big way. The flavors are homey and rich. It reminds me of something I would have eaten growing up. I like those meals. The ones that feel like home. Maybe I should also take a minute to address the fact these soups that are born out of desolate fridge habitats, and one’s absolute need to not step foot in a grocery store, are rarely lookers. Instead, they are hearty, nourishing-looking things. They’re handsome. You know, kind of like the way you might refer to your husband’s great aunt Beatrice. She’s a handsome woman. Sturdy. From good stock (which I’m pretty sure works as a soup pun, so BAZINGA!). We throw around the term “rustic” in order to show you that handsome lady soup is totally charming. Perfection is boring. 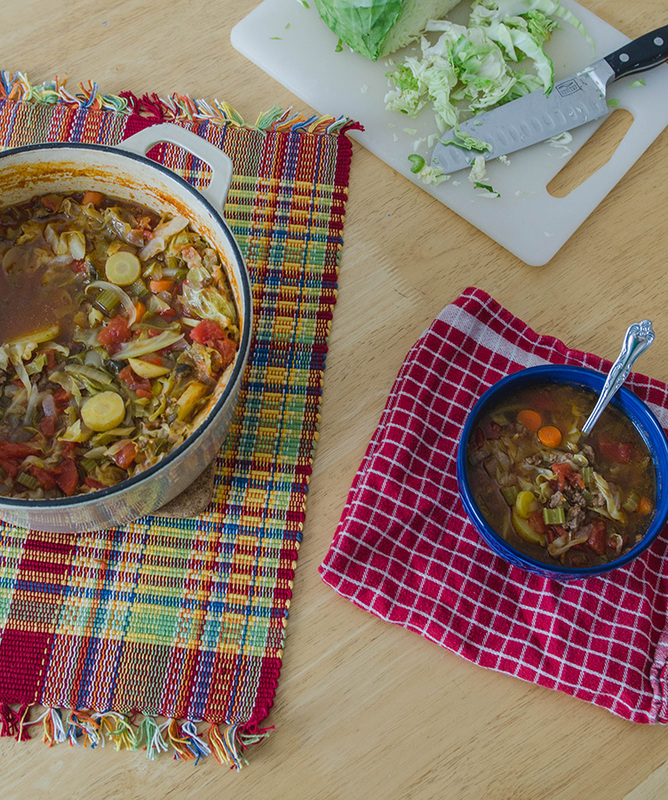 If this soup was a person, she’d be in her late seventies, most likely have some questionable chin hairs — yet she’d have the best stories and give the warmest hugs with her doughy, old lady arms. I like her. I hope we get to hang out. I hope she teaches me how to play bocce later. I hope that somehow by making this pot of rustic delicious fridge soup, I’ve manifested some sort of real life soup grandmother. Can’t she be real? Gosh, life just isn’t fair sometimes. At least I didn’t have to go to the grocery store. At least it’s not made solely of fancy mustard and pickles. It’s the small victories. In a heavy bottomed soup pot, heat up your olive oil over medium heat. Once the olive oil is hot, add in the onion and minced garlic. Saute until the onions are soft and the garlic is fragrant. Add in the ground beef and break it up with a spoon. Allow the beef to brown. Season with oregano, salt, pepper and granulated garlic to your taste. I like to use a decent amount of salt in this recipe as we are adding potatoes and they absorb a lot of salt. Once your beef is browned, add in the celery, carrots and potatoes and stir. Add in the entire can of diced tomatoes with their juices and stir again. Allow to cook together for a couple of minutes. Add the beef broth and the shredded cabbage, stir together. Allow to simmer on the stove for at least thirty minutes. After thirty minutes, taste your soup and adjust the spices to your liking. You might need to add a little more salt or pepper. This was so delicious! I did change it to Bison since I have a weird thing with ground beef. My dad tried my leftovers and loved it, so he begged my mom to make it this week. She did and she also raved about it. So comforting and I loved how it provided sooooo much leftovers. I’m definitely going to be making this one again and again this winter. Also, can I ask…where did you find your multicolor placemats? They’re so cute! Thanks, Lindsey! 🙂 Oh, and those placemats were a gift from a family friend! They’re fun, right? This looks very tasty and easy to make! I can’t wait to try it during my Whole30. Could you tell me how many servings this approximately makes? Thanks! It makes a big ol’ pot of soup. I’d say it would serve 6-8 people. If I make it for my husband and I we can eat it over several days. Looks great! I’m planning to make it tonight. If I do this in the crock pot, would you suggest sautéing the onions and browning the meat first or just throwing it all in? do you drain the fat from browning the beef or does that stay in? Sorry if that’s a stupid question. I don’t cook a lot! This soup was delicious!! I used turkey bone broth because my store didn’t have beef bone broth and being that I’m doing the Whole 30 I had to find a broth without any sugar…the bone broth was the only suitable kind. The soup is really really tasty… it’s def a keeper recipe that I have already recommend to others!! That’s great, Brett! I’m so glad. I actually LOVE turkey broth. It’s so flavorful! A couple months ago, I did a Google search for “paleo recipes ground beef” and came across this. We made this dish that night and loved it, including the kids. Having never been a big cabbage fan, I was very surprised how much I enjoyed this meal. A couple tweaks I made were to top each serving with fresh chopped cilantro and diced avocado. For mine, I also added a couple shakes of crushed red pepper to give it a little heat. Delicious! This sounds delicious I’m going to try it. Question though since I’ll be the only one eating it can I freeze a portion of it? Hi, I am just starting the whole30 plan and I was wondering if you have tried substituting for chicken and chicken broth instead? I can’t find beef bone broth where I am and I am trying to avoid red meat for a little while 🙂 Also, I love your recipes, I can’t wait to start using them today! Loved this! Made exactly, except used sweet potatoes. Barely fit all ingredients in my stock pot; this makes a lot! 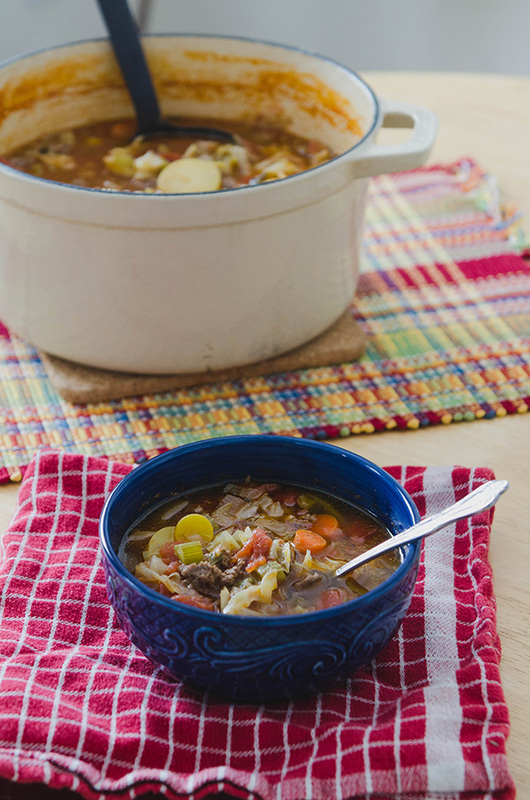 My mom used to make a soup like this that she called “Hamburger Soup”. I loved the chewiness of it. The only difference I can see is she added a bag of frozen mixed vegetables. It makes a ton of soup! I always have to remember to freeze some. Then it’s wonderful to find in the freezer when you don’t feel like cooking. Could this be made in the crock pot? Thanks! Hello! This looks great. If I was to use sweet potatoes instead of regular potatoes, would you recommend changing the recipe at all? Could this recipe be made in the slow cooker? What do you think the time frame would need to be?